Gates open at 4PM. Seats are on a first come, first served basis. 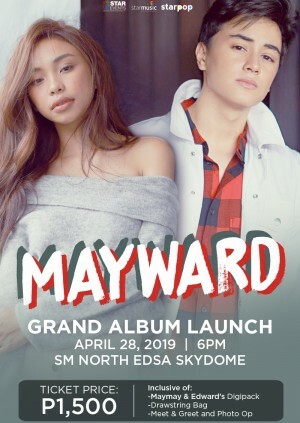 EDWARD BARBER AND MAYMAY ENTRATA COMBINED ALBUM LAUNCH. TICKET SERVES AS THE QUALIFIER. BUYERS WILL ALSO RECEIVE EDWARD'S DIGIPACK, MAYMAY'S DIGIPACK, DRAWSTRING BAG WITH MEET & GREET AND PHOTO OP.